It is time to share with you my favourite nut roast ever! I have no idea where it actually originated, but I have been eating it for about 25 years and it hails from my earlier years when I was vegetarian. Sadly, I cannot claim it as entirely my own, although I know that I have altered it slightly as the years have progressed. If anyone out there recognises it, please let me know and I would be more than happy to give both credit and gratitude to its creation. Although it is slightly time consuming to make, it is definitely worth the effort if you are having a celebration (whether you are vegetarian or not). It looks extra special, goes a long way (it will feed 10 to 12 people) and tastes fantastic. If you are replacing for a hot 'roast', it goes amazingly well with a tomato-based sauce and can be dressed up with baked fresh pineapple for a fruity twist. I personally love it cold, as the centre-piece of a celebratory or party buffet, and served with a spicy chutney or tasty coleslaw...... yum! This is one of those dishes I make every year at Christmas.... without fail. Other nut-roasts have rarely come close. To counter the time that it takes to prepare, I generally make two at the same time and pop one in the freezer for another day. This roast is full of the most amazing ingredients. 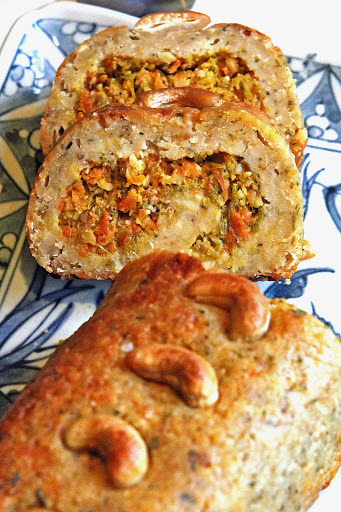 Its nut base is a combination of cashews in the outer layer and hazelnuts in the stuffing. It is beautifully savoury and fragrant with the addition of a wonderful selection of mediterranean herbs. It is richly cheesy with a goodly handful of sharp mature cheddar. The characteristic depth and nuttiness of the sesame is unmistakable and adds an almost oriental waft across the palate. And as a final treat, it has a hint of a sweet edge from the addition of a touch of honey and the sautéed, slightly caramelised veg. The combination of flavours and textures is quite unique...... the crisp baked outer coat encases a soft, nutty, cheesy under-layer....... all twisted round a vibrant ribbon of contrastingly nectared leak and carrot stuffing. If you thought nut roast was....... well...... 'nut roast', think again. 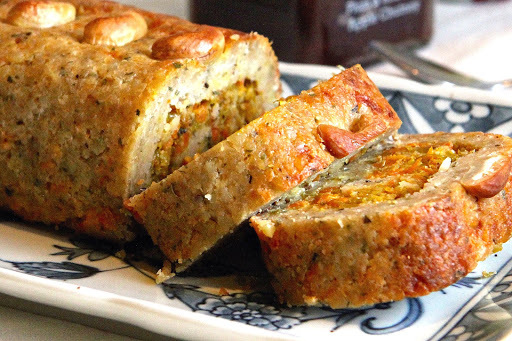 This nut roast takes it one stage further. Once you have tried it, you will be hooked for good, meat-eater or not! I say this from experience. I have, over many years, fed it to guests of all ages and all backgrounds and dietary inclinations. I have delivered it to party tables and served it as Sunday lunch. The recipe has been requested over and over again and has been adopted by many friends to be recreated in their own kitchens. Because it is so fantastic cold, it is also perfect for slicing and taking on picnics and in packed lunches. I confess, I have also enjoyed it way too many times for breakfast, grabbed straight from the fridge, held in hand and munched down without so much as a plate in sight. Historically, I made this roast with usual wheat-based glutinous breadcrumbs. Since becoming a gluten-avoiding family, I have made it with a number of different GF breads, but would strongly advise using either a more moist homemade crumb or adding a little extra egg if using shop-bought commercial breads which tend to be rather dry in comparison and can easily add their crumbly-nature to the roast. For this particular roast, I used a home-baked oat bread (which I hope to publish soon) which worked beautifully. This recipe is a keeper. For those of you who venture to make it, I hope it brings as many years and meals of enjoyment as it has for me. Tea Time Treats with Janie at The Hedge Combers (in collaboration with Lavender & Lovage) who are looking for inspirational packed lunch goodies. This is one of my favourites! Extra Veg with Helen at Utterly Scrummy. Cooking with Herbs with Karen at Lavender & Lovage who asks us to reach into our winter store cupboards for helpful ingredients. This dish is packed full of good stuff from my larder....... from nuts, herbs and seeds to oil and honey. Perfect for winter cooking! Make the stuffing first : Saute the leek with the oil for about 5 minutes in a large saucepan. Add the grated carrots and continue to cook for a further 15 minutes until the carrots are soft - stirring frequently. Add and stir in the ground hazelnuts, sesame seeds, sage, thyme and oregano, salt and pepper and honey. 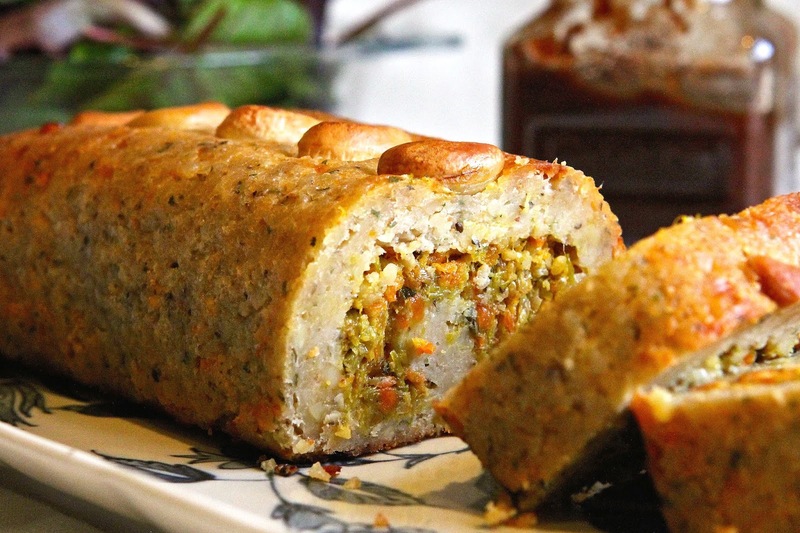 Outer roulade layer : Mix the ground cashew nuts with the breadcrumbs, grated cheese, parsley, basil and salt and pepper. Stir in the egg yolk and the milk until all the ingredients have blended and you have a thick, sticky mix. Cut a large oblong of baking parchment and carefully spread and press the cashew nut mixture into an oblong shape about 1.5 to 2 cm thick. When cool, spread the stuffing mixture over the top evenly, leaving a gap of about 2 cm at each long side to allow for both starting the rolling process and sealing the final edge. Using the baking paper to help you. carefully roll the roulade from one long side, keeping the roll as tight as possible. Gently press the final edge together to seal and smooth with your finger tips. Seal the ends by gently squeezing together. Carefully squeeze together and smooth any cracks that appear. 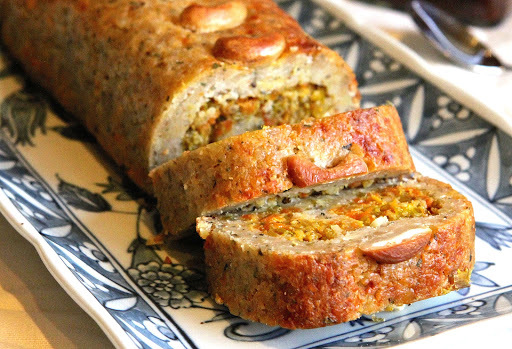 Decorate the top of the roulade by carefully pressing whole cashew nuts into the surface. Wrap the roulade in baking paper and chill for at least an hour before baking. Pre-heat the oven to 180 C/350 F/Gas 4 and base line a large baking sheet with baking paper. Place the roulade on the baking sheet and roast for about 45 minutes until golden brown. Check occasionally and if it appears to be browning too quickly, place a piece of foil over the top to protect it. Serve with chutney or a gravy/sauce of your choice. It goes equally well with a tomato-based sauce or traditional vegetable-stock based gravy. I am so intrigued! I was veggie for 8 years many moons ago, but I have always avoided nut roasts as I thought they sounded pretty gross if I'm honest. To this day have never so much as tasted one! However, I am inspired by your enthusiasm and am pinning your recipe. PS thanks so much for sharing with Tea Time Treats! I know Janie. So many nut roasts are just mush. But this one? I urge you to try it. Really! You won't be disappointed (and I have very high standards). 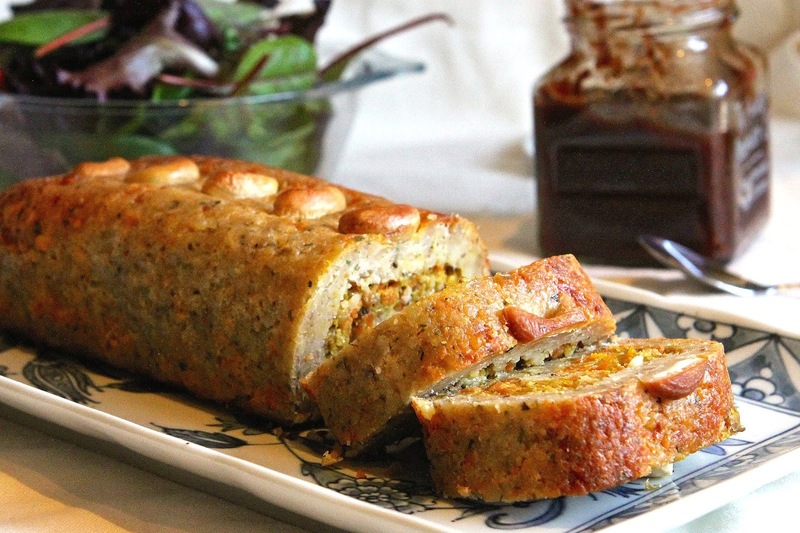 oh my word, this looks like such a wonderful nut roast! The pastry alone is like it's own food group!... it's adorable. Just back from LA and there was SO much gluten free choice you would have fainted!... Happy new Year! Thanks Dom and Happy New Year! I trust you had the best time ever in the US?! I have heard that GF is BIG over there.... I haven't been since we went GF, but have every intention of getting over in the next couple of years. It will be good not to have to fill the UK suitcase with bread, crackers and biscuits! Wow that looks seriously impressive! 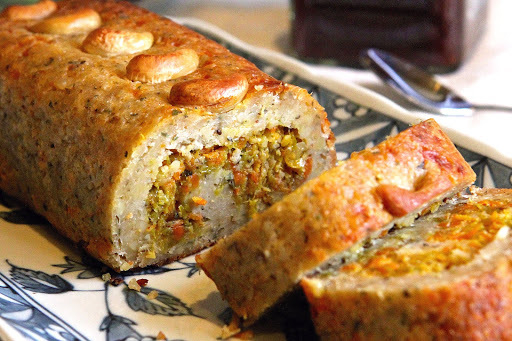 I love nut roast, having been a vegetarian for many many years earlier in my life, and this one looks super impressive! I am going to pin it to my recipes to try board on Pinterest and will be making it for my still vege mum! Thanks Vicki. Definitely try it.... it is worth all the effort! Oh I want to eat it right now! I have had a love affair with nut roasts since going vegetarian. I have a standard christmas nut roast which is really simple because there is so much other food about but I have already pinned and bookmarked it. 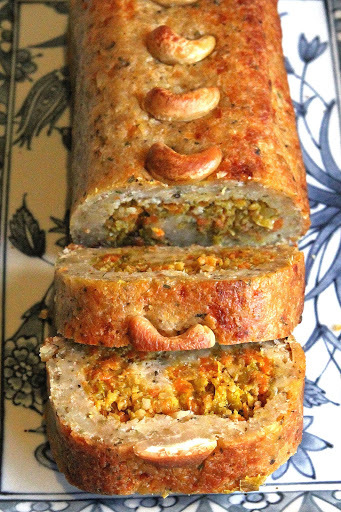 Stuffed nut roasts often are quite fussy for me and I have a horror of roulades. But this looks so good and you have sold it so well that I just need a special occasion. Hi Kate - made this today - it tasted great but did not go golden brown like yours - which might be due to my oven. I used a swiss roll tin and wonder if it was bigger than your tin as my swirl disappeared in lots of rolling. Can you let me know what size tin you used? Interestingly, I don't use a tin to roll it, but sort of estimate length depending on what tin I want to bake it on. I roll the base (nut-cheese) layer with a piece of baking paper if it is too sticky and make it as oblong as possible by pushing back the sides (about 15 inches by 11 inches I guess). Then I spread the veg layer over the top with the back of a spoon/palette knife so that it stays as a distinct layer. Both layers should still be quite thick and defined. Then roll with the help of the baking paper. You should get clear swirls that way. If it needs browning a little more, don't be afraid to leave it in the oven a little longer. I have a fan oven and it does tend to get a little hotter than some. Let me know if you have another go. It is well worth 'perfecting'! Thanks so much Johanna! It's great to see someone else enjoying food we like and post! Your post was fab..... I LOVE the idea of Christmas in July!!!! It makes the best packed lunch Alida. Nothing else required and totally delicious! Thanks Emily. Let me know how it goes! Thanks. I agree CC! They make a lush nut loaf! You're welcome Helen. It's one of my favourite dishes.... it needed to be shared! This looks so delicious. I love the stuffing swirled inside, it looks very festive indeed! Thank you Janice. The contrast of the stuffing is as delicious as it is attractive! I'm a big fan of nut roasts, but I've never had such a posh one as this. Love it. My mother does a stuffed lentil roast which I enjoy, but this definitely has the edge. This looks totally awesome! I'm a vegetarian and my daughter is a gluten free vegan. Is there a possible adaptation that you know of so that my daughter could enjoy this dish as well? Thank you. It should be quite easy to sub the cheese for a vegan cheese, use dairy free milk and perhaps use a 'flax egg' or egg substitute for binding? The main issue would be the 'sticking together' of the ingredients, but you could always layer, rather than roulade if it doesn't feel quite sticky enough. i'm going to make this on Sunday for my sister in law who is a vegetarian, i'm so excited about it. This sounds amazing, but I'd have to replace the cheddar cheese with something as I have an intolerance to hard cheeses when melted. Do you think I could use mozzarella or soft goat's cheese instead? Hi thankyou for sharing. I m going to attempt this for our hot tropical Christmas but can i make and freeze and at what stage. Compiled and uncooked? Or cook fully then freeze? This is an amazing roulade whether hot or cold. I hope you enjoy as much as we do. I have made and frozen many times, but always freeze BEFORE baking. Make the roulade and then chill unbaked on a tray lined with baking paper in the fridge to firm up a little before wrapping in fresh baking paper... and then put the wrapped roulade in a freezer bag to keep fresh and freeze! I've often made two or three at a time and then baked and eaten them a few months later. They've been fine. LOVE it cold with a little chutney or coleslaw.... one of my favourite Christmas treats!